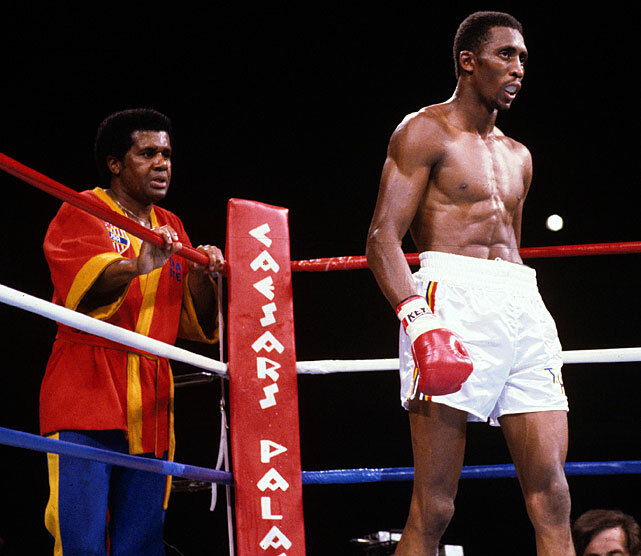 The Sugar Ray Leonard vs Thomas Hearns fight in 1981 was significant for so many reasons. You had two of the best, if not the best, fighters on the planet with the winner to be regarded as the best in all of boxing. Leonard, the reigning WBC welterweight champion, had avenged his only defeat to Roberto Duran in the infamous “No Mas” rematch. Hearns, the WBA welterweight king was unbeaten, scoring 30 knockouts in 32 bouts. They billed this unification match to decide the undisputed welterweight king “The Showdown,” and indeed that’s exactly what it was. Hearns was three years younger and held a four-inch reach advantage. 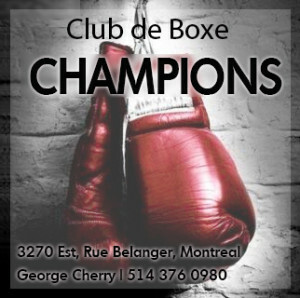 Leonard was coming off a huge victory over WBA super welterweight titleholder Ayub Kalule to win his second world title. Hearns had made three successful defenses of his crown including stoppage wins over Randy Shields and Pablo Baez since scoring an electrifying two round knockout of the formidable Pipino Cuevas. “The Hitman” had an aura of invincibility and fearsome power, while Sugar Ray was widely viewed as the most talented boxer alive. A “showdown” was inevitable and it was one of the biggest sporting events of the decade. 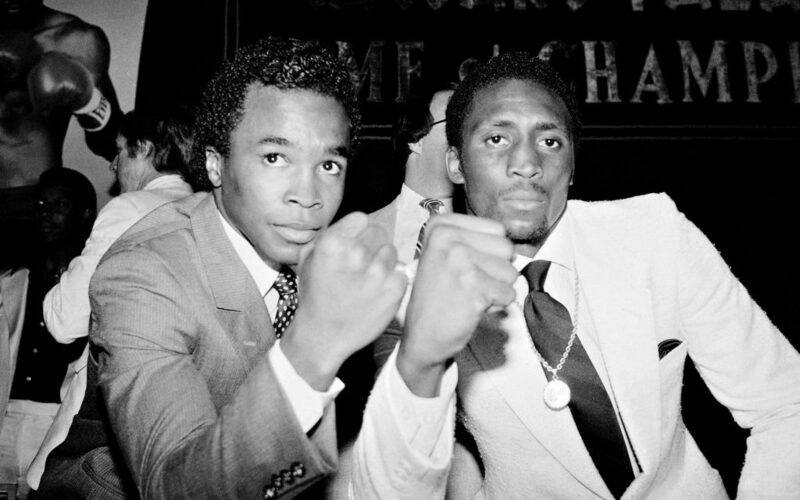 Now, 35 years later, both Thomas Hearns and Ray Leonard were happy to share with me their memories of that historic match. Even after all these years the recollections of it remain vivid for both men and both expressed mutual respect for their former rival as well as astonishment at how fast the years have gone by since. But despite the passage of time, neither questions the importance of that first meeting for their careers and their legacies. Despite their public utterances at the time and the posturing for the press, both men had tremendous respect for each other’s talent and ring accomplishments. Leonard was especially impressed with Tommy’s title-winning effort. Hearns demolished Pipino in two. A 25,000 seat outdoor arena at Caesars Palace was the venue for the richest match in boxing history. 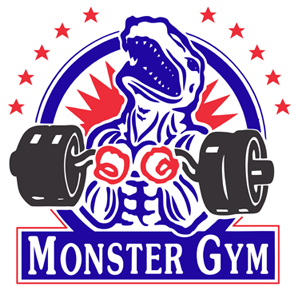 Ringside seats were $500 and buying them were celebrities like Jack Nicholson, John McEnroe, and Burt Reynolds. Approximately 300 million people in 50 countries watched Hearns vs Leonard on live closed circuit television or tape delay. Confident and cocky: Ray and Tommy pose for the cameras. Leonard’s strategy coming into the match was to outbox Hearns, make him uncomfortable, and wear him down. 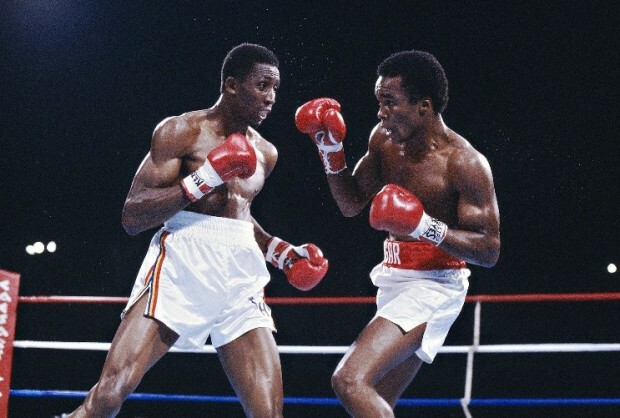 For example, Leonard wanted to get Hearns to move to his left which would force “The Hitman” to exert extra energy in order to get into position to throw his powerful right hand. Since Tommy’s stamina was still a question mark heading into this tilt, Ray wanted to make him work every minute of every round. Ray had intended to test both his opponent’s endurance and his chin. Meanwhile, Hearns planned on moving forward behind his long left jab to control the flow of the bout. He felt he could outpoint Leonard with the jab and also keep him off balance. The idea was that Ray would have to think about the jab every time he tried to throw shots, which would keep his punch output low. Tommy would then feed off of the jab by following up with right hands and left hooks before Leonard could respond. The result was a tight and tense tactical contest in the early rounds, neither man having a substantial advantage. Tommy’s jab was a problem for Ray. All three ringside judges scored all but one of the first five rounds for Hearns. “The Motor City Cobra” was able to land enough of those sharp jabs while largely moving forward to control the tempo of the match. Round four was a great example of this as Hearns landed multiple jabs as well as a hook to the body that got Leonard’s attention. Ray was competitive, but reaching and pawing while his left eye was already beginning to swell. In the fifth Hearns continued to land the jab and Leonard went back to his corner at the end of the round visibly frustrated. However, the momentum was about to shift dramatically in round six. Leonard landed a right to start off the round, as Hearns snapped home jabs to the body and head. 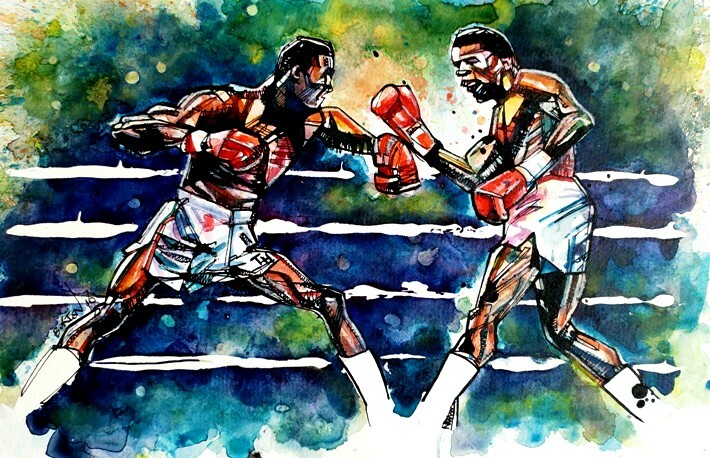 As a confident Hearns moved forward carrying his left hand low, Leonard ducked under a Hearns overhand right and crashed home a powerful left that buckled Tommy’s legs. 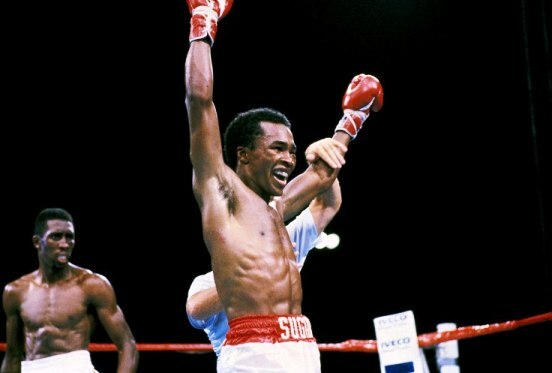 Ray followed up with a two-fisted attack and Hearns fought back valiantly, but it was Sugar Ray connecting with the punishing blows, most of them left hooks to both body and head. At the bell Tommy’s back was to the ropes and he was holding on to survive. Ray would go on to win the next two rounds and overturn the course of the fight. Leonard’s power came to the fore in the middle rounds. Following the instructions of his trainer, Emanuel Steward, the boxer they called “The Motor City Cobra” changed his tactics, but according to Hearns this was something they had anticipated might be necessary. 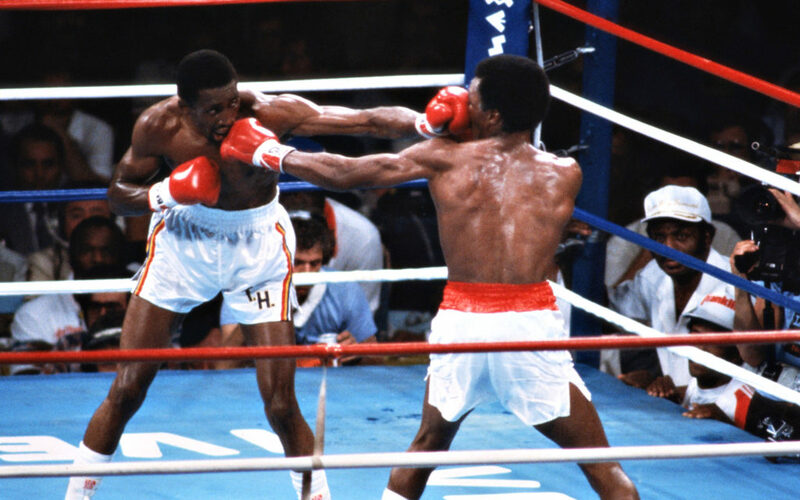 Starting in round nine, Hearns was most effective while boxing on the outside and had success connecting with the jab on Leonard’s left eye, as well as landing left hooks and right hands to the body. 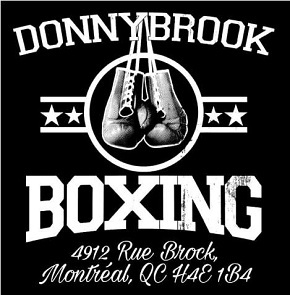 It was another abrupt change in the progression of the bout and suddenly Tommy was the more effective of the two as he won the next four rounds. 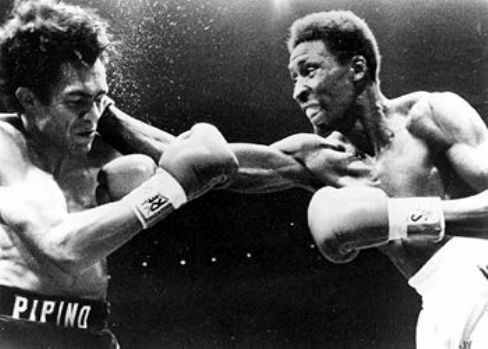 At the end of round 12, Hearns was in control while Leonard desperately needed to turn things around. 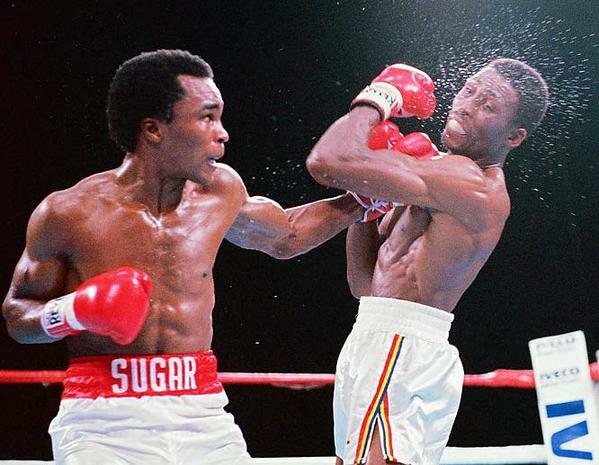 Sugar Ray had only three rounds to regain the momentum and he had to dig deep to find a way to do it. As the bout moved to the 13th, Leonard’s left eye was almost completely closed. But midway through the round Ray landed a monster right hand that had Hearns reeling across the ring. Leonard followed up with a flurry of rights and lefts that sent Hearns careening through the ropes, but referee Davey Pearl did not rule it a knockdown and allowed the bout to continue. Tommy managed to score with a right and left, but Ray was walking through his punches now and he landed a series of blows which left Hearns tangled in the ropes. Pearl ruled it a knockdown and as the round ended Hearns stumbled back to his corner. Still well behind on the judges’ scorecards, Leonard came out for round 14 determined to end the fight. A vicious right hand to the body hurt Hearns and then one to the head put Tommy in a world of trouble. Leonard continued to dominate, landing shots at will until referee Pearl finally stopped the match with Hearns’ back to the ropes. The crowd roared as an exhausted but jubilant Sugar Ray was embraced by his team. 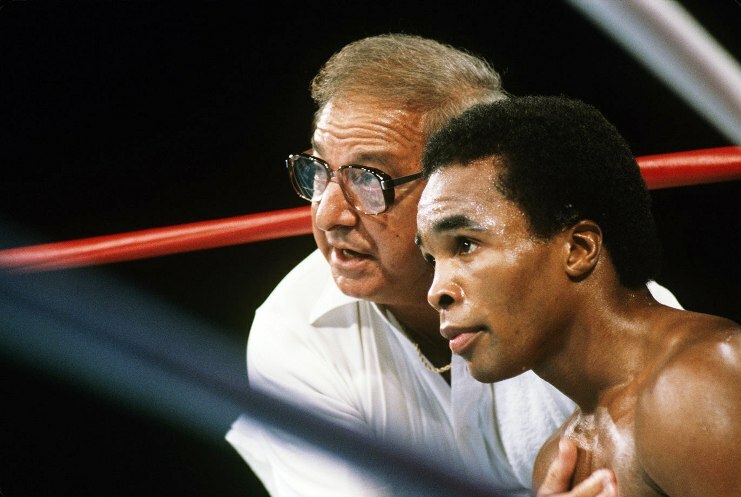 Leonard and Hearns singled out their respective trainers, Angelo Dundee and Emanuel Steward, and both admitted that their cornermen were instrumental in shaping their careers. Their rivalry was a thing of beauty, one that each fighter knew was special. The separation between the two was so minimal that, while both entered the ring with a game plan, neither had a clear sense of what was about to unfold. In 1989 they clashed again, this time for Leonard’s WBC super middleweight belt, and a second action-packed war ended in a controversial draw. Ring Magazine hailed their first meeting as 1981’s Fight of the Year and in 1996 judged it to be one of the Ten Greatest Fights of All-Time. The bout featured so many dramatic twists and turns and so much suspense that, to this day, it remains one of the all-time best battles in the history of the welterweight division. 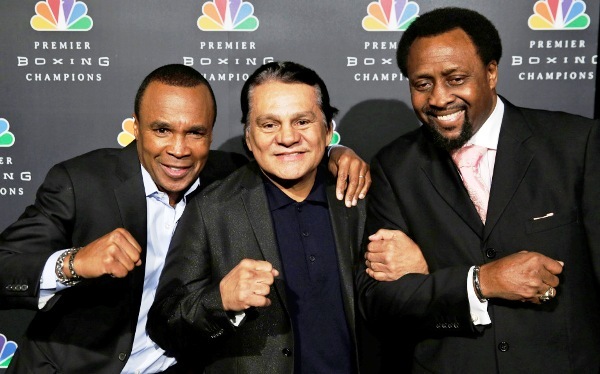 Leonard and Hearns (here with Roberto Duran) are now good friends.